Last updated: May 2017 (regular updates not required). 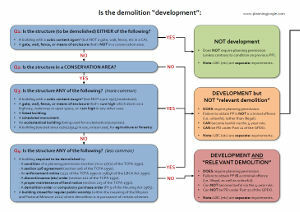 - Section 196D of the above TCPA 1990 provides the starting point for the definition of "relevant demolition". - Section 63 and Schedule 17 of the above ERRA 2013 inserted section 196D into the TCPA 1990. - Article 2 of the above Order brought into force section 63 and Schedule 17 of the ERRA 2013. - Section 74 and section 75 of the above LBCA Act 1990 are referenced by the definition of "relevant demolition" within section 196D of the TCPA 1990. - The above Direction sets out that certain types of demolition shall not be taken to be "development" for the purposes of the TCPA 1990. - The above Direction constitutes the type of “direction” referenced by section 75 of the LBCA Act 1990. - Article 3(10) of the above GPDO excludes “EIA development” (note: subject to article 3(11) and 3(12)). 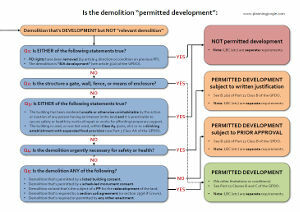 - Schedule 2 Part 11 Class B of the above GPDO permits “the demolition of a building”. - Schedule 2 Part 11 Class C of the above GPDO permits “the demolition of the whole or any part of any gate, fence, wall or other means of enclosure”. - Regulation 73 of the above Regulations amended article 3(10) and 3(11) of the GPDO 2015. - Article 4 of the above Order amended Schedule 2 Part 11 Class B of the GPDO 2015.